Jewish marriage proposals are rich in history and tradition. When a Jewish couple is ready to consider marriage they may want to weave some of the ceremonies, traditions, and symbolism into their proposal was well as the actual betrothal and wedding. The marriage contract is what we consider to be the proposal in western society. Long ago, if a man was walking along and saw a young lady that he wanted for his wife, he would have a marriage contract drawn up. In it he would list all of the things he had to offer the girl that had caught his eye. The suitor would then offer the woman a glass of wine. If she drank it she would indicate that she was accepting his proposal. She didn't have to drink it; there was no obligation for her to do so. Once she had sipped the wine the happy groom went to prepare the bridal chamber. She then hones the homemaking skills that she has learned until she is ready to begin married life. Modern day Jewish brides are, of course, doing all of the same preparations that any bride to be makes. The betrothal ceremony was integrated into the wedding ceremony in the 11th century. A Jewish bride and groom will speak the vows of the betrothal prior to speaking the wedding vows during the actual ceremony. When the betrothal vows are finished the bride and groom each drink some wine. Next come the nuptials, and more wine. Now it is time for the Jewish marriage proposal. Before the groom places his ring on the bride's index finger he may recite the following phrase in both Hebrew and in English to make sure all that are present can understand what he is saying. Harei at me'kudeshet li be'tabaat zo ke'dat mosheh ve'yisrael. Behold, thou art betrothed unto me, with this ring, in accordance with the Law of Moses and Israel. It is important that the bride and the groom understand the serious step that they are taking. Most Jewish traditions hold that the marriage between a man and a woman is a symbol of the relationship between God and the Jewish people. The modern day Jewish couple will most likely not follow all of those procedures with the same seriousness that their ancestors did. Many of them have become symbolic, or have been adjusted to fit in today's lifestyle. 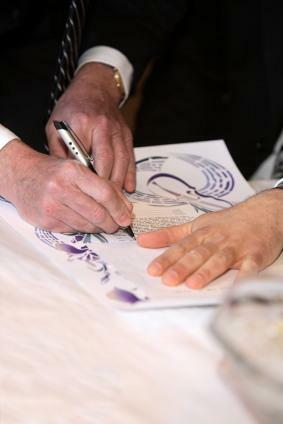 The marriage contract, or Ketubah, is still used. Now it is likely to list the bride and groom's commitment to each other rather than the monetary benefits that the groom intends to bring to the marriage. While in the past the bride-to-be did not receive an engagement ring, the modern Jewish couple will often choose [[Jewish Engagement Rings|engagement rings]. The groom might pour his intended some wine, but it does not have the meaning that it once did, other than symbolically. Jewish marriage proposals are rich with symbolism and traditions that have roots in ancient customs. A couple that honors those things while creating their special day is rich indeed.